All transactions are safe and secure with a reliable history in online sales behind each of our associates. 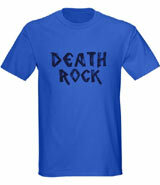 Buy Beavis and Butthead t-shirts like the Cornholio t-shirt and Death Rock shirt. 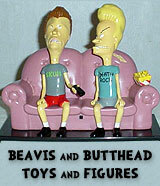 Browse Beavis and Butthead figures. 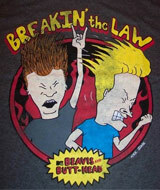 The MTV Beavis and Butthead TV show is a crude 90s cartoon created and voiced by Mike Judge. 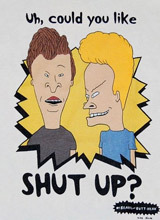 The two metal head Highland High School students, one a blond with an under bite and the other a brunette with braces, collected a cult-like following by amusing viewers with their odd music video critiques. 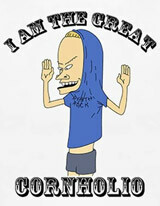 Grab some nachos and peruse our gallery of Beavis and Butthead t-shirts including the I Am Cornholio shirt, Beavis costume Death Rock tee and Butthead costume Skull t-shirt. 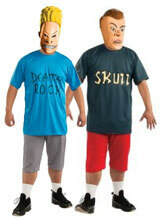 See the Beavis and Butthead Do America movie and collect action figures. 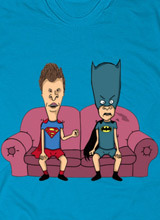 Like this Beavis and Butthead tee says, they've come for your T.P. The dimwitted duo are up to their ordinary hijinks again, and this time their depravity includes stealing your toilet paper. If you think they plan on using it for its intended purpose, you're clearly mistaken. These idiots have much more creative plans for your bum tissue. Expect to see it in your tree or don't be surprised if they use the rolls as pretend binoculars like Butthead is doing here. Teachers are frustrated at their lack of comprehension and incessant chuckling, but who can blame them? 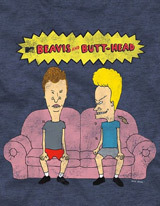 Link to: Beavis and Butthead T.P.